Home .auto tech .auto tips How to rotate your tyres? 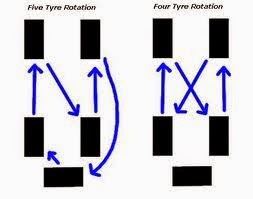 How to rotate your tyres? The Tyres of your car needs rotation because each tyre wear out differently. Thed rotation of tyres make the life of the tyre prolonged saving your money in long run. It's funny that I have been explained how to do that a million times, but the picture made more sense than anyone else who has told me. Thanks for that! I cannot understand from this picture. At least, you should use tyres in the picture. Better solution is to share video for it, with a simulation.